With over 25 years of competition at the professional level, 25 years at the division I collegiate level, and over 15 years competing at the SoCal club level, the Industry coaching staff grows stronger every season. Returning coaches with over 9 years experience with the Industry and adding in some world class talent including Edison Zhou, a former Chinese national team player and 3 time Chinese national gold medal champion, and Justin Toth, a middle blocker for the division I CSUN mens team and Sports Performance prodigy, we are excited for all of our inspiring Industry athletes and their amazing opportunity to continue to receive diverse world class coaching and instruction. Training with the Industry for over a decade, Coach Meaghan has been the club director and driving force behind the club for the past 3 seasons. After a stellar collegiate career that included being nationally ranked in the top 10 her junior year in kills per set and points per set in Womens Division I volleyball, a top 15 ranking her senior year, and breaking 7 different school records including career kills, kills per set, kills per match and points per set, Meaghan has come back to the valley and is currently pursuing a professional career on the AVP pro beach tour. She is a NESTA certified Sports Nutrition Specialist and the lead coach at the Industry VBC. With a deep coaching and playing background coupled with her knowledge of sports nutrition and athletic training her ability to help players reach all of their volleyball and athletic goals is unparalleled. Our most tenured head coach, Colleen Tobin comes from one of the best volleyball backgrounds in the country. Coming up through the #1 club in the United States, Sports Performance, Colleen won gold in 16 Open at the Junior Olympic National Championships and medaled her 17's and 18's seasons. She then went on to play for full scholarship at CSUN as a standout Outside hitter. Coach Colleen has assisted at top indoor camps across the country for multiple major universities and clubs. Her technical mindset and immense volleyball IQ makes her a coach to be reckoned with at any level of play and a coach that brings a level of knowledge rarely seen to the club level of training. Having played in the Industry club since sixth grade, moving on to the collegiate level to play for Nova Southeastern, then UCLA beach, and now University of Hawaii beach, Coach Laurel has continued her progression to the highest levels of play. With over 11 years of experience as a player, coaching within the club since her sophomore year in high school, and now coaching at camps and clinics at both UCLA and University of Hawaii, she has already accumulated over 8 years of coaching experience at the top club levels of play. Wrapping up her final season at Hawaii and finishing her career with a National Championship Record of 8-2 she is ready to move forward into a professional volleyball career. We are exited to have coach Laurel back in the club full time as she pursues her professional career. As the only player in our club history to have played on all three of our Junior Olympic qualifier medal teams, Ari has set her spot in the club history books. With two silvers and a bronze on the USA volleyball side, and multiple Gold medals on the AAU side, Ari stands alone as the most decorated player in our club history. Now she will wrap up her career at the University of Hawaii with the most match wins in school history. The same Ariana Homayun who started her career here as a player in sixth grade, vocalizing her dream school as a 7th grader, UH, and now will leave her stamp on the schools history books. Over 100 match wins for coach Ariana over her career and an absolutely stellar record over 3 years at the National Championships. Starting her coaching career her sophomore year in high school by assisting with our top younger teams, continuing on to coach at the top club levels of play both locally and abroad, and currently competing for the University of Hawaii with athletic scholarship, Coach Ari has proven she knows the game as well as any coach. Coach Jen was setting high school records and raising the level of play in our area as early as 2005! She will now be entering her second season with the Industry and we are stoked to have her aboard. She has proved to be a great technical coach and valuable staff member already. Co-Head coaching our top 13's team last season she had multiple undefeated weekends and helped our top team all progress forward in their understanding of the game and level of play. A product of SoCal club volleyball and the Industry technical standard Coach Jen continues to bring excellence to the gym every day. Coach Alex started in our club as an eager 6th grade player hungry to win and and hungry to improve. Over her 4 year tenure at the Industry she earned a junior olympic qualifier silver medal, was setting and playing on our top 16's team as a U14, and hit and set for our top 18's team as a freshman in high school. Her love for the game and phenomenal work ethic lead her to the top of the pack and she brings that same love of the game and hard work to the court as a coach. As one of the top players to ever play in the club we are stoked to have Alex back in the club and working with our players on both the beach and indoor side of the game. As she heads off to Cal Berkely this season she hopes to walk on to the Cal beach program and will continue to assist us in clinics and holiday training until she returns at the end of the spring semester. A standout club player in our local community followed up by a state championship season at Pierce College, Morgan brings his experience as a top notch player to the IndustryVBC. With previous club coaching experience and great insight as a player for the game we are fortunate to have his high energy coaching style in the club. Heading up our 16-1 team this season and assisting with almost all of our other teams, Morgan has proven to be a great addition to our already deep IndustryVBC coaching staff. With coach Meaghan Wheeler helping to head up the Pierce college program it was almost a given that Joanna would come into the Industry VBC coaches fold. As a Pierce college player pursuing higher levels of technical excellence and understanding of the game she has immersed herself in the sport with both club and Pierce college training. A gifted athlete she looks to improve her technical background as she assists with our local teams bringing her high energy and love for the game to every practice. We look forward to having Coach Jo in the program for years to come as she helps us establish a more consistent program for our newest members. Coach Don is one of the youngest tenured coaches in the valley starting his coaching career at the age of 18 as the head coach of Kennedy High School. Now entering his fourth year as a Varsity head coach we are excited to have him join the Industry club staff. Coach Don brings a technical mindset and a level of physical and technical understanding beyond his years to the club and he has been instrumental in helping us expand our 14’s top team to two Elite teams with both groups being equally competitive and driven. 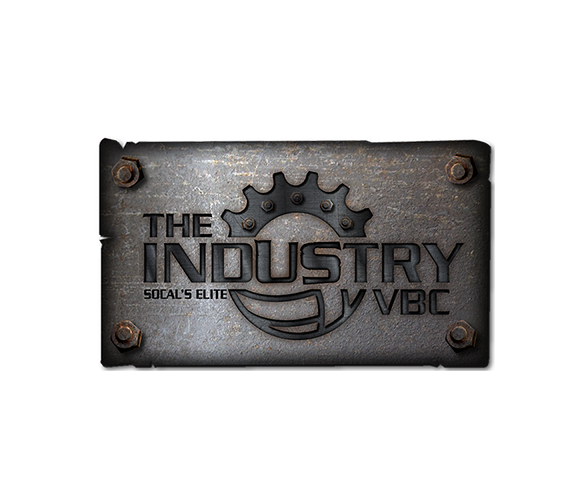 Founder and creator of the Elite VBC in 2002, now transitioning into the INdustryVBC as the market has become over saturated with Elites, Andrew comes from an extensive sports background. Graduating high school as one of the top 3 soccer players in the state of Tennessee, competing at the Division I level for Stetson University before suffering a career ending injury he started his athletic training career in 1992. Working with athletes from almost every sport discipline, volleyball became the focus as he pursued professional levels of play. Only 6 years after picking up the sport of volleyball he competed in his first professional qualifier. Transitioning to the professional level of play on the beach he also competed briefly with Pierce College as his professional beach partner Tom Black was head coaching during a run of multiple state championships. At that time Indoor and Beach were not considered separate sports so the professional beach career won out. Deciding to focus solely on the beach side Andrew was fortunate enough to compete and train with more than 12 olympians, work and coach with Gold Medal coach Dane Selznick, Bronze Medal coach Gene Selznick, Womens National Team Assistant coach Tom Black and a myriad of other top pros and professional coaches. The culminations of his playing career were a top 48 national ranking, a brief stint as the #1 ranked defensive player on the professional tour, and a 3rd place finish in the 1998 Manhattan Beach Open, considered the Wimbledon of Beach Volleyball. Fortunate enough to work, train and compete with some of the greatest players and minds in the game of volleyball his coaching and athletic training career now spans over 25 years of excellence.